Days ahead of his departure for the Great War, Doctor John McCrae wrote to his mother a sentiment likely shared by every soldier going his way: “I am really rather afraid, but more afraid to stay at home with my conscience.” One hundred and one years ago today more poignant words were penned, only this time McCrae’s words would not resonate with his fellow soldiers for just the fleeting moment; those words would represent them as a whole for evermore. During the Second Battle of Ypres, as the Germans’ poison gas ravaged the Western Front and left 70,000 Allied troops dead, wounded or missing, a grieving McCrae sat in the back of an ambulance. He looked to where the dead lay nameless and voiceless in Flanders fields, and, seeing the wild poppies in bloom, began to write. 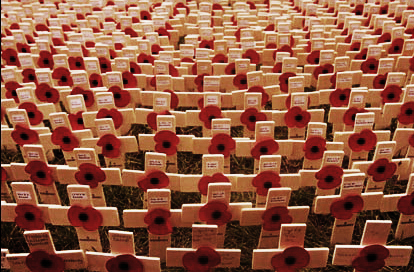 World War One was a war unlike any other. It was out with the old and in with the new, bayonets outnumbered by machine guns and the cavalry replaced by conscription. It gave rise to a new kind of voice, a poetic voice, as the common man became entangled: we had the vitriol of Siegfried Sassoon, the harrowing recollections of Wilfred Owen and the impenetrable darkness of Isaac Rosenberg. Poems about war, of course, already existed – “Cannon to the right of them/ Cannon to the left of them!” – but never before had war poetry been a genre in its own right. McCrae’s poem, however, stood (and still stands) in a place of its very own, for he wrote not with the voice of one man, but the voice of every man. Like so many great works of the war, ‘In Flanders Fields’ was inspired by the loss of a friend. On the morning of May 2nd, twenty-two-year-old Lieutenant Alexis Helmer was directly hit by a German shell and killed instantly. That same day what remained of him was buried, with McCrae himself conducting the funeral service due to the chaplain’s absence, and a wooden cross that has since been lost was left to mark Helmer’s place. As yet another day of desperate fighting came to a close, the outpouring of McCrae’s emotions began to surge. By morning his work was done. Legend has it that a dissatisfied McCrae discarded the poem soon after its completion, and it was only when his fellow soldiers retrieved it that he was convinced of its worth. And how worthy it would come to be. The poem’s path to immortality was almost immediate. As with Decca and The Beatles, ‘In Flanders Fields’ was initially rejected by The Spectator magazine, but McCrae continued his quest for publication undeterred. It was published anonymously by Punch on December 8th 1915, and received with open arms by an adoring public. Captivated by the intense unity exhibited in the short, anthem-like poem, soldiers and civilians alike embraced its sentiment. It acknowledged the “crosses, row on row” and the need for mourning, but more significantly it spoke of the poppies that grew and blew between them, poppies that symbolized hope and renewal despite the tragedy. Looking back with what we know now, ‘In Flanders Fields’ can be seen as a kind of doorway relic, for it reflects a time before the war turned to total despair, before Owen truly needed to denounce ‘Dulce et decorum est pro patria mori’ (‘It is sweet and fitting to die for one’s country’). Among the moved millions was professor Moina Michael, who famously penned a response to the poem when the war ended, ten months after McCrae’s untimely death from pneumonia at age forty-five. ‘We Shall Keep the Faith’ sees Michael pledge to “wear in honour of our dead” the “Poppy Red,” a vow she fought passionately to fulfill on a scale far bigger than herself. She knew that the last traces of war remembrance would fade, that the flags would be taken down and the masses would move on, and so she campaigned with unreserved devotion to turn the poppy into the emblem for those who died. Historically she would come to be known as ‘the Poppy Lady’, because now, every Armistice Day, we in the Commonwealth wear that poppy and ‘In Flanders Fields’ is recited. John McCrae gave a voice to the voiceless, brought hope to the hopelessness. Let’s let the poppies do the rest for the Dead, let their opium take hold, and have faith that they can finally find their sleep. This entry was posted in World Events. Bookmark the permalink. Passionate words for a passionate poem surely written by a passionate person. Beautifully written and informative…a very moving account. What a beautiful way to remember. I couldn’t get over that final sentence because it went out on a limb and just STAYED there. Keep on writing, your potential is massive! Yet another insightful and potent OTD post, full of unashamed passion and an informed, unusual angle on history that rings true. The line “It gave rise to a new kind of voice, a poetic voice, as the common man became entangled” is dead right. Certainly, replacing a small professional force with mass conscription was the major part of it, but there is something else too. Primary education had been made compulsory in Britain 40 years earlier, so the generation fighting in 1914 was the first to grow up with literacy being a normal skill. The common men not only experienced the war, they were able to write letters and, of course, the poetry that would have been impossible for their ancestors. That these things came almost entirely uncensored helped to drive home the horror of the war. The British military learned to put that one right afterwards, in the same way that the American experience of conscrption in Vietnam taught the government a lesson. Thus the 21st century American wars happen on the scale of Vietnam but without the protest. No pictures of coffins returning, no forcibly taking middle America’s children to die. Instead make it a volunteer force, augmented by “private contractors” for the security and/or dirty work. Then they bulk up the numbers with plenty of foreigners. Al Jazeera did an expose showing that a third of US troops in Iraq were not even American, they were foreign nationals, massively Mexican, who would be fast tracked for US citizenship after their tour of duty (assuming they suvivved). You know that scene in Gangs of New York where Irish immigrants arive and are given their naturalisation papers, then at the next table along they’re told that, as citizens of the union, they are now conscripted to fight? Like that, only without even getting your papers first.